** Jason Merrells plays Juror 8 in Southend, Wolverhampton, Barnstaple and Croydon. Produced by Bill Kenwright Limited in Association with Birmingham Repertory Theatre and Nica Burns. 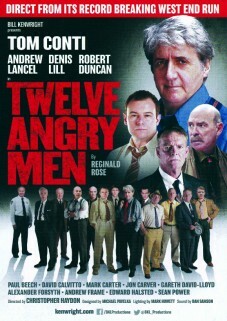 Following its record breaking West End run, this powerful new production of Reginald Rose’s gripping courtroom thriller Twelve Angry Men has been hailed as the “classiest, most intelligent drama in the West End”. It brings to the stage the taut brilliance of the 1957 three-time Academy Award nominated film which was produced by and starred Henry Fonda, and is considered to be one of the great ‘must-see’ movies of all time.